GentleShower Ergonomic Massage Recliner Chair offers you the most relaxation and comfort. It's ideal for any room where relaxation is the order, like the den, media room, living room or office.Once it's time for a massage, you're in complete control of 8 massage motors with the easy-reach hand remote.The handy pullback control that lets you effortlessly recline. Easy-clean pu leahter upholstery with heavy-duty iron frame construction are durable for long-lasting companion. 2- Turn the unit ON by pressing the POWER button once, The LED will illuminate when power is on. 3- Turn on the massage in each zone by pressing the BACK, LUMBAR, THINGS or LEGS buttons. LEDs will illuminate when each zone is activated. To turn off a zone, press the button again. 5- To change the massage intensity press the INTENSITY button. FULL BODY CUSTOMIZED MASSAGE: Gentleshower massage recliner chair features 2 intensity levels, 5 massage modes and heating option. In total 8 vibrating massage nodes and different levels of vibrating intensity are sure to offer you the finest relaxation and comfort for your back, lumbar, things and legs. HEATING FUNCTION BUILT-IN: A heating function in the waist area warms and soothes the body's aches and pains as you sit and recline, meaning that it's not only relaxing, but also beneficial to your overall well-being. The heat mode can be toggled on or off and is used to improve blood circulation for a more effective massage treatment to help with muscle recovery. 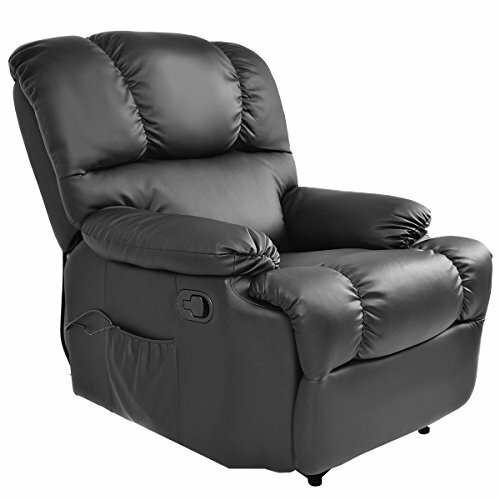 MULTIPLE STAGES OF RECLINING: With the manual pullback control (just under the armrest), you can have multi-level recline choices, just choose the most comfortable way to sit and enjoy the massage recliner. 25-MINUTE AUTO-OFF FUNCTION FOR SAFETY: The massage mat is equipped with an auto shut-off feature that will turn the cushion unit off after 25 minutes of continuous use to ensure your safety. EASY-TO-USE CORDED HAND CONTROL: Includes a handy attached remote control to select and control customized massage functions at your own personal convenience plus a side pocket to hold it and other small items. Come with a detailed user manual, easy to assemble.